I just continued on expanding the panel using my eq8 program so that the quilt would end up around 90″ x 90″. I used a beautiful quilted panel picture from the internet that Kelly had made as the center in my program to help me visualize how my borders would look. I started this before Easter.. then took a break from it while I renovated my sewing room… this was the 1st project that I finished in my new sewing room.. here it is on the design wall before I quitted it. I had a lot of fun quilting this I started with my top borders. 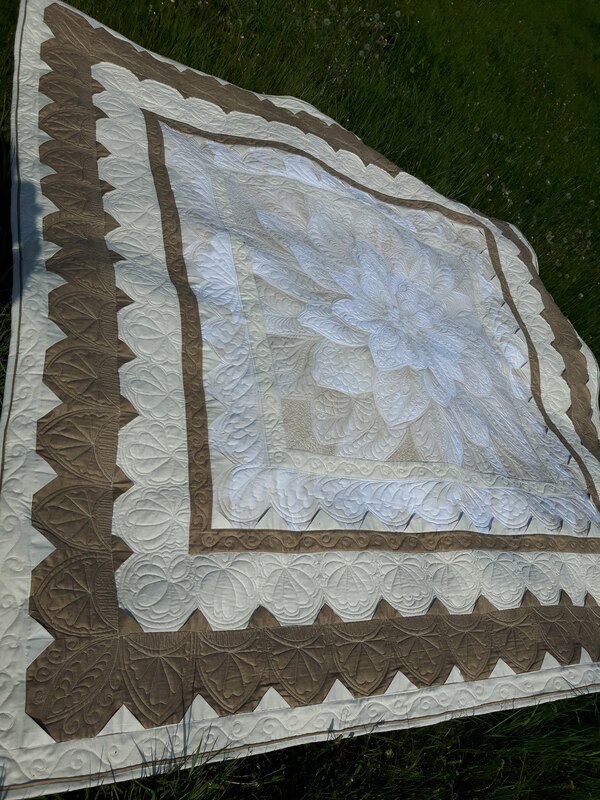 I used arc rulers then filled in the shapes with Free motion Quilting. As I was quilting I had a helper… Not really as I had to watch he kept chasing my needle as I quilted. Once I was in the middle I used ruler to do the center then I outlined the petals and ran a 2nd outline to give it some separation…then filled in the petals as I went with Free motion feathers.. I do not use marking pens it is all done winging it. I worked to quilt it from center out and up then center out and down.. I did not finish the side borders till after the bottom border was finished and I turned the quilt to work horizontally to do the sides. Here are pictures of my quilting. and finished quilt.. You can click on pictures to make them larger. this is the front and back of the full quilt I used flannel for the back. I actually love the back and it has prompted me to make a whole cloth quilt in the future. Can you explain to me how to make the little flaps on your quilt? Thank you so much for showing me a video! I’m just learning to quilt and this is wonderful! You are welcome.. I strongly believe in helping other quilters perfect this art… I don’t think it should all be for the money which too often it is.. I enjoy sharing the skills i’ve learned so others can continue this craft. Love your quilt, Renee!! Just popping over from the FMQAw/BNQ on facebook. I’ll be following you now!! Thank you. i don’t post often only when i feel there’s something to share weather it be a tip or a quilt ive worked on.. Im always willing to help others.